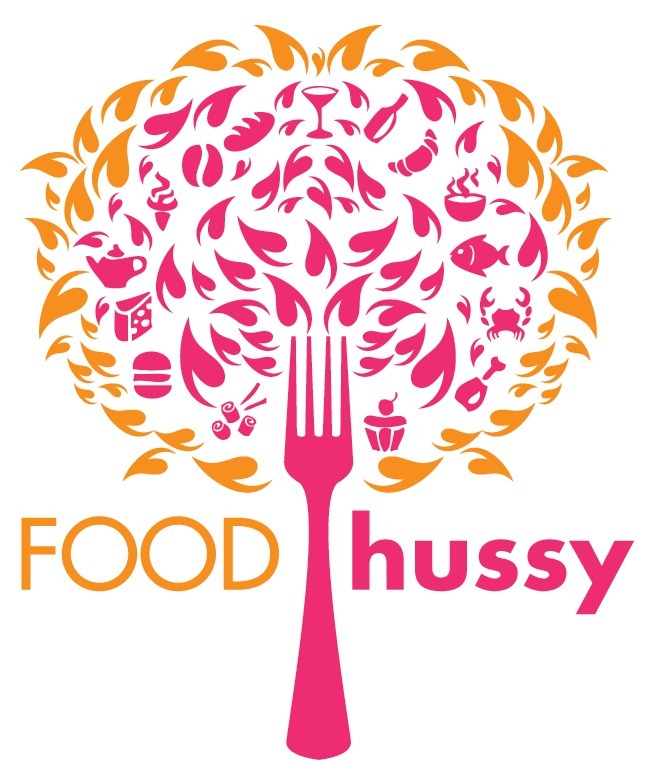 Restaurant Review: Dancing Roll Sushi & Macaron Bar - Hyde Park | The Food Hussy! I recently did a craft night at AR Workshop in Hyde Park and before the class I decided to grab a bite to eat - conveniently enough there was Dancing Roll Sushi right across the street and I had never been! I was definitely in the mood for sushi - Larry doesn't love it so I never get to have it! The problem for me is - I want a bunch of different stuff and that gets $$ so I went with one wackadoo roll and one simple. But what to choose? Uh - wait - there's a roll with a hot dog on it?????? Done! 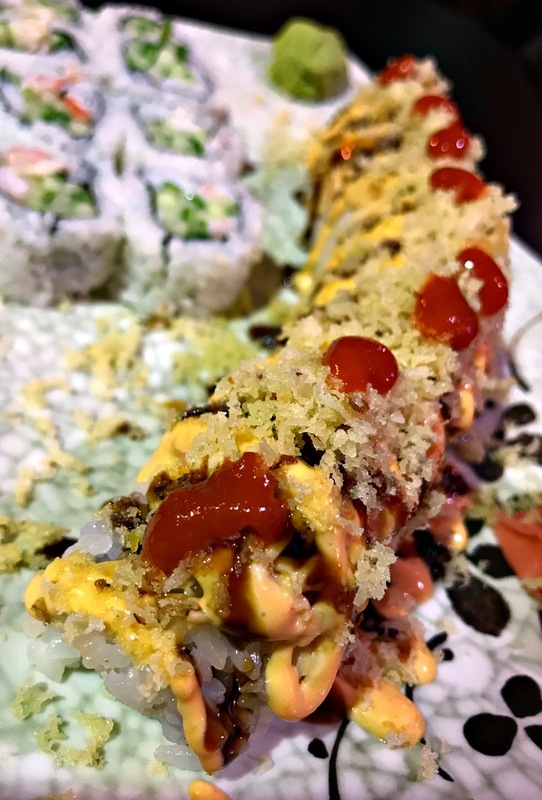 I chose two rolls - the Don-Dog Roll with cream cheese and hot dog on the inside - then it's topped with spicy crab, eel sauce, spicy mayo, Sriracha and tempura flakes. 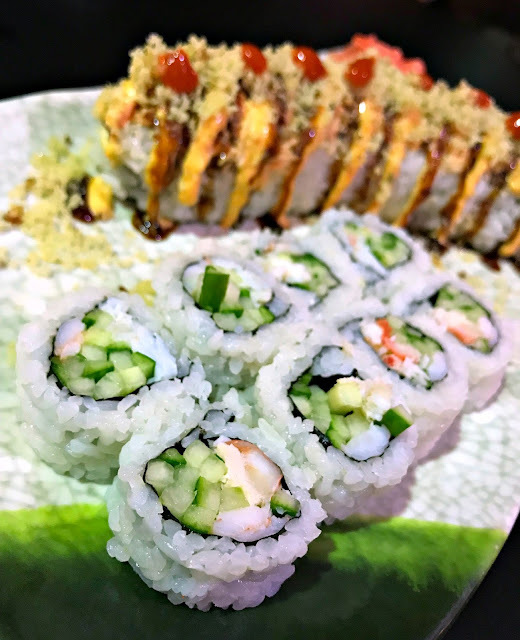 (Top roll - $10) and the King Crab roll (bottom - $9.50). The King Crab roll has shrimp, King Crab and cucumber. 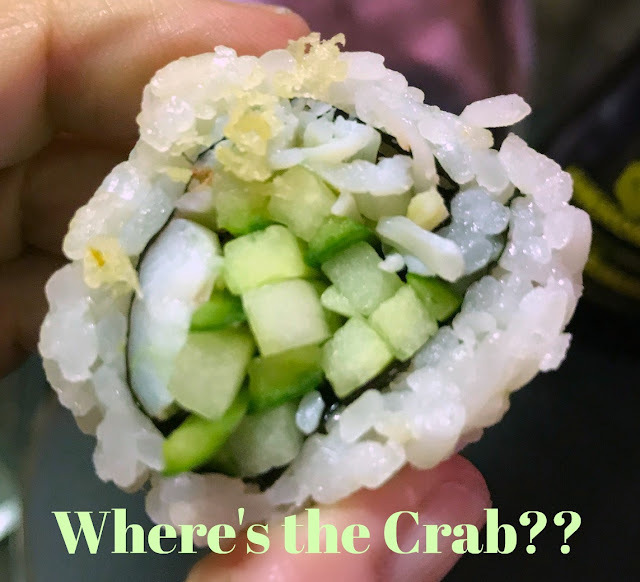 Do you notice anything unique about the King Crab Roll? Maybe that there's NO KING CRAB!?! I mean - come on - you want to charge me for cucumber and rice. This was ridiculous. I also don't understand the point of the "half price sushi every day" that everybody has (not just Dancing Roll) - if it's "half price every day" JUST CHANGE THE FRIGGIN PRICE! I think the lack of crab made me a little bitchier than normal. ;-) It's just dumb. Here's the inside shot of the Don-Dog Roll and unfortunately the hot dog sushi was not as good as you'd think it would be!?! It was too much cream cheese really - I think it would have been better if it had been paired with more traditional interesting ingredients. It was fine but I should have gone for a more normal fancy sushi roll. I also saw they had chicken wings on special for like $6. 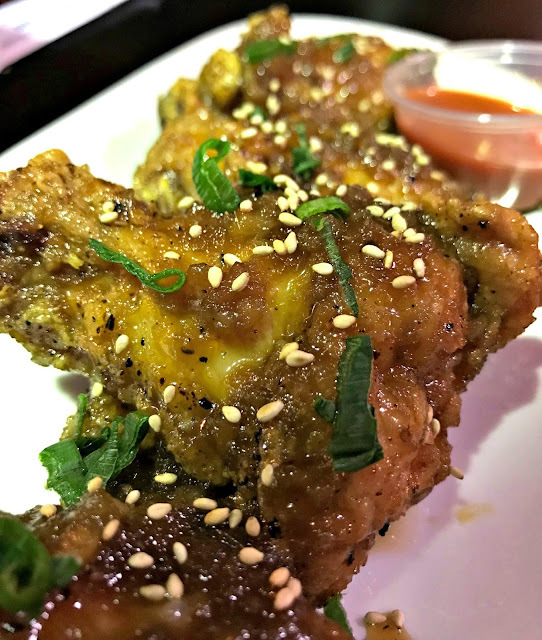 They were spicy honey wings - they were very sticky. Good, juicy and crunchy breading - they were a little spicy for me and I really just wanted to try them - not bad. Why Should You Go? Well I applaud them for trying something different in the world of sushi. I give them a slap on the hand for charging me extra for a King Crab Roll with the faintest sliver of King Crab. 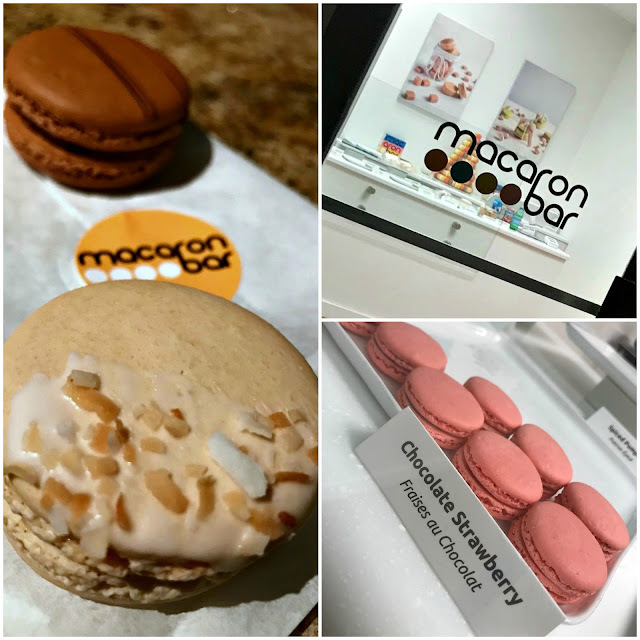 And because I had a few minutes before class - I went next door to the Macaron Bar. I've never had a macaron - ever - ever ever - and I'd heard so much - I was excited. I asked the girl working if she could tell me about the varieties and what makes theirs so good. She was less than helpful and muttered two words. I made a couple of selections on my own and they were fine. I didn't love the texture of the cookie. If you've never had one - they're soft and chewy but not like a chocolate chip cookie - you can tell there's a lot of egg white in there - it's a weird chewy.